The Dark Forest is surrounded on virtually all sides by woodland. This setting means that the area has a strong atmosphere, which really adds to the theme. Whilst being a rather large area it really can feel like the forest is closing in on you at times. All of the buildings in this area have a very "excavational" feel to them, with construction-style chain lights draped around them, and rusty metal signage. The theme of the area is further conveyed by the vines which appear to be weaving their way up everything, and the prominent tree taking over Rita's station, as well as the high-rising scaffolding of Th13teen. The Dark Forest area has been through numerous re-themes throughout its life at Alton Towers. The area originally opened as the Talbot Centre in a nod to the rich history of the Towers themselves. Attractions at this point included the Corkscrew coaster, and little else. Then in 1984 the area became known as Festival Park and under this name the area saw many attractions come and go, including Enterprise at one point. 1999 bought yet again another re-theme to the area, this time taking guests back to the days of cavemen and dinosaurs as Ug Land. 2008 saw Corkscrew operate for the final time, ready to be removed to make way for Secret Weapon 6 and a whole new themed area. 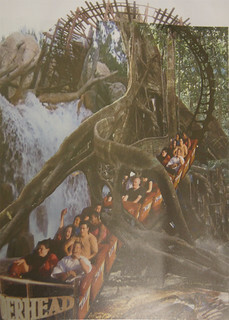 In 2010 the area reopened as the Dark Forest, with a rethemed Rita and the new coaster Th13teen making it their home.